621. svakshah - The Beautiful-Eyed. The nAma can be understood by looking at the two parts which constitute the word- su + akshah. SrI Samkara's vyAkhyAnam is su - sobhane puNDarIkAbheakshiNi asya iti svakshah - He whose eyes resemble the lotus-petals. SrI BhaTTar continues his anubhavam of seeing pirATTi and bhagavAn together -his interpretation is that bhagavAn has these beautiful eyes which arethoroughly proficient in the art of the enjoyment of the nectarine ocean of Herbeauty. We may recall that the hue of bhagavAn's kaDaik-kaN is describedas reddish, and pirATTi's eyes are dark-hued. The anubhavam of this by ourelders is that His kaDaik-kaN (corner of the eye) is reddish in colorbecause He is always looking at the beautiful reddish complexion of pirATTithrough His side glances, and Her eyes are dark because She is always enjoyingthe beautiful dark complexion of bhagavAn. 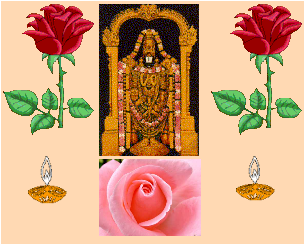 She is "nArINAmuttamA vadhU" (SrI v.v. rAmAnujan). tiruppANAzhvAr describesthe beauty of His eyes - kariya Agip puDai parandu miLirndu Sevvari ODiap-periavAya kaNgaL ennaip pEdaimai SeidanavE". SrI satyadevo vAsishTha gives the interpretation that bhagavAn is svakshahbecause He views the whole universe seated in the Sun chariot, and He is the eyeof everything that exists. 622. sva'ngah - The Lovely-bodied. The interpretation is similar to the previous nAma - su + a'ngah = sva'ngah. Su - SobhanAni a'ngAni asya iti sva'nah - One whose limbs are beautiful (SrISamkara). He has a beautiful form that captivates all His devotees. See the anubhavam of tiruppANAzhvAr, svAmi deSikan, hanumAn, etc., referencedbelow. SrI BhaTTar'as anubhavam is that He has a celestial body that is worthy of beingadmired by even lakshmi. SrI Baladeva vidhyAbhUshaN echoes the sameanubhavam - lakshmI spRhaNIya divya SarIra dhArI. BhagavAn's soundaryamleads Her to declare "agalagillEn" (SrI v.v. rAmAnujan). In sundara kANDam, vAlmIki gives a very detailed description ofevery aspect of Lord rAma's beauty through 16 Sloka-s in hanumAn's words (35,7-22). We also have tiruppANazhvAr's beautiful description of Lordra'nganAtha's beauty in his amalanAdi pirAn. His beauty just makesAzhvAr just conclude his praise of the Lord with the declaration "enamudianik kaNDa kaNgaL maRRonRinaik kANAvE". svAmi deSikan describesLord ra'nganAtha's beauty in bhagavad dhyAna sopAnam and many other stotra-s.
"High hath the Mighty risen before the dawning, and come to us with lightfrom out of the darkness. Fair-shapen agni with white-shining splendorhath filled at birth all human beings" (translation from Ralph Griffith). Alternatively, since bhagavAn has created this Universe with beings which allhave the capability to move around and perform their functions, He is calledsva'ngah. 623. SatAnandah - He of infinite Bliss. SrI BhaTTar's vyAkhyAnam is that He has boundless Bliss which is ever flowing onaccount of the mutual love of pirATTi and bhagavAn. SrI v.v.rAmAnujan comments that the number "hundred" here does not mean thenumber "100", but stands for the greatness of the extent of the Bliss. SrI Samkara interprets the nAma in terms of His being of the form ofInfinite Bliss, and quotes from the bRhadAraNya upanishad - etasyaiva AnandasyaanyAni bhUtAni mAtrAm upajIvanti (4.3.32) - "Compared to His Bliss,the bliss of all other beings is a but a minute fraction". SrI satyadevo vAsishTha gives yet another view of the Infinite Bliss of bhagavAn. Other than Him, each creature feels pleasure when it is in some particularenvironment, and feels pain when it is in a different environment. Thus, afish feels pleasure when in water, and feels pain when outside water. Forhuman beings, it is exactly the reverse. For birds, it is a different kindof medium. But for Him, His Bliss in independent of any constraint, andthus He is of Infinite Bliss. The Anandam of everything else flows fromthe One and Only source of true Anandam - SatAnandah. The dharma cakram writer explains the concept of pErAnandam starting with thelittle Anandam of tge immobile (sthAvara) beings such as plants, which derivetheir pleasure through the sense of touch alone. The worms derive their pleasure through the sense of touchand taste. Slightly more evolvedbeings such as the ants derive their pleasure from the sense of touch, taste,and smell. Beings such as the bees derive their pleasure from thesense of touch, taste, smell, and sight. The animals derive their pleasurefrom the additional sense of hearing. Man derives his pleasure from themind in addition. Yet ordinary people seek cheap material pleasures withall these gifts, and end up enjoying the impermanent pleasures, just as the fish enjoys its sense of taste and falls prey to the fisherman's hook. Only a true yogi reaches the next level, that of AtmAnandam. This nAmashould teach us to meditate of on the "SatAnanda" mantra on Him, andderive the permanent Anandam. 624. nandih - He who is ever delighted. nandati iti nandih - He who is delighted is nandih. SrI BhaTTar: He is nandi because He is ever prosperous by virtue of Hisbeing with SrI at all times, at all places, and in all ways. His constantand inseparable association with SrI is the reason for His constant delight. SrI Samkara: paramAnanda vigraho nandih - One who is the embodiment ofSupreme Bliss. SrI rAdhAkRshNa SAstri: His Anandam is such that the humans and the deva-scan look to Him to derive the true Anandam - He is the Bestower of their trueAnandam. a)The Lord of the host of lustrous deities (nitya sUri-s). b) The Lord of the luminaries (the stars, sun, moon, etc.). The simple meaning of the nAma is - He who is the leader of the luminaries. The difference in the vyAkhyAna-s centers around who the luminaries are that isbeing referred to in the nAma. "ayarvaRum amarargaL adhipati" of nammAzhvAr. The nitya sUri-sare shining with the kaimkarya SrI to bhagavAn and pirATTi. - When He shines, all the others shine after Him. and from the gItA - yadAtiya gatam tejah (15.12) - referring to the brilliancewhich is in the sun. The dharma cakram writer gives the analogy that just as a person who does nothave eyesight cannot see the light around him, one who does not have j~nAnamwill not be able to see the jyoti-gaNeSvarah residing in him. One has tofirst rid oneself of the darkness of kAma, krodha, etc. in him, before one cansee the light inside. This is the lesson to take form this mantra. a) He whose mind has been conquered (by His devotees). b) He who has conquered His Mind. SrI BhaTTar has thus far interpreted the previous nAma-s 608 up to 625 in terms of His association with pirATTi. Now he proceeds to interpret the next few nAma-s in terms of His extreme sauSIlyam (the quality of amiability). SrI BhaTTar's vyAkhyAnam for the nAma "vijitAtmA" is that bhagavAn revels in being conquered by His devotee; this is His real nature. When a devotee goes and bows before Him with devotion and sincerity, bhagavAn is easily conquered by the devotee. Recall that kRshNa makes the promise at the start of the mahAbhArata war, that He won't take to weapons during the war. Then, in the course of the war, bhIshma, the great devotee of kRshNa, takes a vow in front of kRshNa that he will make kRshNa take to weapons the next day during the fighting. Everyone including bhIshma knew kRshNa's earlier vow not to take to arms. And yet, since His great devotee declared that he will make kRshNa take to arms, kRshNa made that word of His devotee come true, and did exactly as his devotee wished the next day. Such is His compassion to His devotee, that He will even break His own promise in order to make His devotee's words come true. SrI v.v. rAmAnujan refers us to nammAzhvAr's tiruvAimozhi 1.3.1 - pattuDai aDiyavarkku eLiyavan … ettiRam. nammAzhvAr who could sing bhagavAn's parattvam in a clear state of mind, could not bear to describe His soulabhyam and the troubles He went through to remain bound to the ural (mortar), get beaten up by yaSodA, etc. AzhvAr passed out and lost His conscience of the external world for six months since He could not bear to think of perumAL going through all this suffering, just to please His devotees. b) SrI Samkara bhAshyam is - vijita AtmA mano yena sah vijitAtmA - He by whom His mind has been subdued or controlled, is vijitAtmA. SrI rAdhAkRshNa SAstri adds that bhagavAn possesses everything there is to possess, and so He has nothing to desire, and thus He is of a mind that is absolutely controlled. The dharma cakram writer indicates that that meditation on this nAma of bhagavAn will lead one to better mind control, and ultimate God-realization. Note that this is one of the nAma-s that was discussed in the posting comparing the bhAshya-s of SrI Samkara and SrI BhaTTar, where the point was made that SrI Samkara tends to emphasize the parattvam, aiSvaryam, etc., of Brahman, and SrI BhaTTar emphasizes the soulabhyam of perumAL repeatedly. SrI P. B. aNNa'ngarAcArya selects all the four nAma-s starting with the current one for his comparison of the bhAshya-s of SrI Samkara and SrI BhaTTar to establish his point. a) He who is of a submissive nature (to His devotees). b) He who has the jIva-s as subservient to Him. c) If a-vidheyAtmA, then He who is subservient to no one. vidheya means subservient. As mentioned in the previous nAma, SrI BhaTTar interprets the nAma in terms of bhagavAn's being subservient to the devotee and His enjoying His subservience. Sri BhaTTar's vyAkhyAnam is that it is bhagavAn's essential nature to be at the disposal of His devotees to such an extent that they can easily command Him to do whatever they want. He gives examples of "Come here, stand here, sit here, eat this", etc. (SrI v.v. rAmAnujan refers to periAzhvAr calling Him - pUc cUDa vA, nIrADa vA, ammam uNNAi, etc.). SrI PBA gives the example of Sonna vaNNam Seyda perumAL. When tirumazhiSai AzhvAr asked Him to pack up His snake bed and leave town, He obeyed as He was told, and later when AzhvAr commanded Him to go back when the king repented, perumAL obeyed AzhvAr's command as well. SrI PBA also gives the example of Lord kRshNa obeying the command of arjuna when the latter ordered Him to take the chariot and position it in between the two armies at the start of the mahAbhArata war - "Senayorubhayor madhye ratham sthApaya me acyuta!". SrI v.v. rAmAnujan gives the example from peria tirumozhi 11.5.5. - vaNNak karum kuzhal AycciyAl mottuNDu kaNNik kuRum kayiRRAl kaTTuNDAn. Similar to SrI v.v. rAmAnujan's examples of "pUc cUDa vA", SrI satyadevo vAsishTha gives the examples from the Sruti-s: "udbhudyasva, pratijAgRhi, ishTApUrtam samsRja", etc. (udbudhyasvAgne pratijAgRhi tavam ishTApUrte samsRjeyAmayam ca" - yajur. 15.54), ("deva savitah prasuva, yaj'nam prasuva, yaj'na patim bhagAya" - yajur. 32.15). b) SrI kRshNa datta bhAradvAj gives the interpretation - vidheyAh -sevakA AtmAno - jIvA yasya iti vidheyAtmA - He who has the jIva-s who are subservient to Him. c) SrI Samkara in this case uses the pATham a-videhyAtmA instead of vidheyAtmA, and gives the meaning "One who is not subservient to any one". Using this pATham, the dharma cakram writer notes that the requirement for one to be not subservient to anyone else, is to win over his/her own self. When one has controlled his/her own indriya-s and manas, then there is nothing that this person needs or wants, and so there is no need to be subservient to anyone else. He gives a story to illustrate the point that want is what makes people subservient to others. Traditionally, the priests of a particular temple were brahmacAri-s, and were devoting themselves wholeheartedly to the worship of God. The local king tried to get them to come to His palace and do some things according to his wish, and they refused to leave their service to Lord. He consulted with his ministers, and the ministers advised the king that if the king can get the priests married, the problem of the king will go away. The king accordingly made efforts tog et the priests married, and succeeded in this effort. Once they got children, their materialistic needs increased, and they voluntarily took temple prasAdam and started visiting the king, in expectation of some material gift from him. So they automatically became subservient to the king without his effort. So the lesson to take from this nAma is that the key to being not subservient to another human being is to win over oneself first - get control of one's own indriya-s and mind. SrI PBA addresses the difference between the pATha-s used by SrI Samkara and SrI BhaTTar, and observes that the version used by SrI BhaTTar is more appealing to a devotee since it brings out the aspect of saulabhyam in perumAL which is in favor of His devotees. SrI BhaTTar associates bhagavAn's kIrti as resulting from His sauSIlya - sauSIlya sattvena asya ati-mahatI kIrtih iti sat-kIrtih. SrI BhaTTar points out that no matter how well we praise His kIrti, it is still only an under-statement. In addition, His kIrti is all truth and no exaggeration. SrI v.v. rAmAnujan refers to nammAzhvAr: "nigar il pugazhAy" - He whose kIrti has no comparison. SrI Samkara emphasizes the "sat" in sat-kIrtih as referring to the true nature of His kIrti - satI- avitathA kIrtih asya iti sat-kIrtih. SrI cinmayAnanda associates the kIrti with His being the Consort of lakshmi. The dharma cakram writer describes two kinds of fame - the fame that comes from material wealth, official status, etc., and the fame that comes because one follows the path of dharma. The former type of kIrti is temporary and transient - one loses it as soon as the wealth or the position that brought the fame are gone, and they go one day or the other anyway. But the followers of the path of dharma - such as dharmaputra or hariScandra - do not ever lose their kIrti; the world praises them forever. It is the kIrti that comes out of following the path of dharma and the worship of bhagavAn that one should follow in order to realize sat-kIrtih, the mantra contained in this nAma. The Dispeller of all doubts. SrI Samkara gives the interpretation that bhagavAn is called chinna-samSayah because He has no doubts of any kind Himself - He realizes everything directly like a fruit in the palm - karatala amalakavat sarvam sAkshAtkRtavatah kvApi samsAyo nAsti iti chinna-samSayah. SrI satyadevo vAsishTha observes that the lack of any doubt in bhagavAn is revealed in the flawless way He executes His acts of creation all the way up to pralaya. Note that SrI BhaTTar links his interpretation to bhagavAn's sauSIlyam, as was pointed out in a recent comparison of the two vyAkhyAna-s.